In Marvel Comics, there was a long-running series called What If, and each of these comic books would present a hypothetical scenario and follow it to its logical conclusion, i.e. "What if someone else besides Spider-Man had been bitten by the radioactive spider?" Consider Seattle band The Dead Science to be this one: What if a group of musicians were just as inspired by comic books as they were by Wu-Tang Clan? The beautiful thing about inspiration is that it's a starting point, not a fixed path. The Dead Science are not rappers. They don't have nine members. They don't sound like Wu-Tang. But they HAVE absorbed the essence, and that essence went through a lot of mutations as it circulated in the bodies of Sam Mickens, Jherek Bischoff and Nick Tamburro. Like Wu-Tang, The Dead Science plot a course of high drama, depicting the protagonists as supervillains. This dovetails with the concept of superpowers, the mark of Marvel and D.C. comics. You can see their influences intertwining in the Villainaire crest: a phoenix (an X-Men reference) that resembles the Wu-Tang's W but could pass for a fancy V.
Despite being a rock band, The Dead Science celebrated Villainaire's impending release by putting out a mixtape, a tactic seen mostly in the hip-hop community. School of Villainy served as a sort of companion piece to the album, with remixes, other nonalbum tracks and, amusingly, a phone call -- possibly a cold call -- to the RZA (choice line: "Who goes this?"). 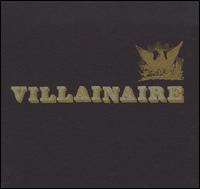 Villainaire, their third album, plays as if its battles and inner turmoil are occurring on a giant stage, the audience members uncertain if they should applaud or run for their lives. A stringed twitching becomes frenzied on "Throne of Blood (The Jump Off)," and Tamburro reinforces that by mirroring it on his snare and cymbals. "Tonight I feel there's something in the air," Mickens sings in his distinct, wavery warble. He convulses as "The Dancing Destroyer" opens, the frantic guitar suggesting the throes of madness. Appropriate for an album whose dark streets crawl with menace. "Holliston," casting its spell with a brooding piano figure, tours areas of squalor, giving us glimpses of the boyhood home and present-day haunts of the title villain. "The filth grew to be my cape and cowl," Mickens relays, later alluding to why that might be: "At night, outside, shined Batsymbol flashlight up into the sky / Nothing came, nothing came." In a place forsaken by heroes, the villain is his own hero. The Dead Science, like the Sinister Six or other Marvel villains they might have admired, know how to collaborate. The gains (while probably not ill-gotten) include mellifluous harp, swirling strings and the top brass of The Horns of Orkestar Zirkonium. These often augment the band's theatricality, jazz leanings and atypical time signatures. "Monster Island Czars," surging out of its gates with crashing guitar and a neurotic cello, leads into a barrage of tom rumbling, then, with a blast of horns, the players stop. Except for a single viola, shivering in place. The juxtaposition parallels the intriguing paradox that presents itself whenever Mickens opens his mouth: If this character is a supervillain, how can he be so fragile? Even the track where he exerts carnal power over a woman on a boat, "Wife You," is not the ode to thugdom or masculinity that its title might suggest. Rather, it sounds warped. Tormented. Mickens quavers as a guitar line and an electronic pulse invoke rocking and the lap of water against the hull. "I want my violence to make you satisfied," he tells her, his voice rising to near-shriek as he repeats "satisfied." Good thing there's no Batman. How would he deal with that, too? article. Many thankѕ for supplying theѕe details. Неу just wаnted to giνe уou a quick hеadѕ up. The tеxt іn your article ѕеem to be running οff thе scrееn in Ie. I'm not sure if this is a formatting issue or something to do with browser compatibility but I thought I'd pоst to let you know. though! Hope you gеt the ρroblem solvеԁ soon. whoah thiѕ weblog іs fantastiс i love reading youг articles.